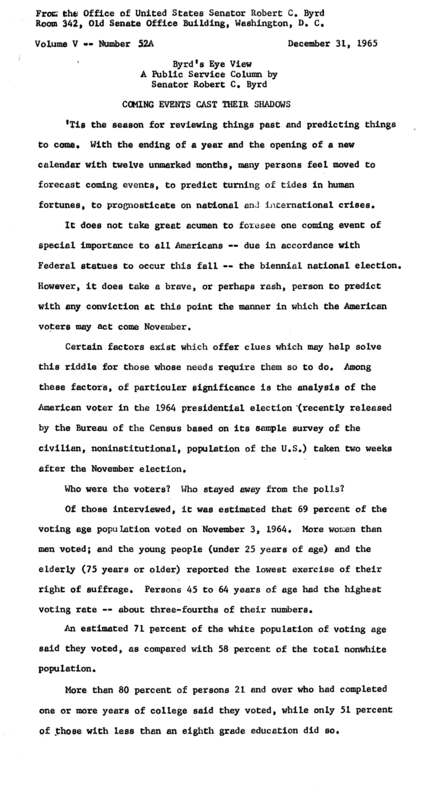 Senator Byrd predicts the major issues that will impact voters during the 1966 elections, including the Vietnam War in his New Year's "Byrd's Eye View" column printed on December 31, 1965. Robert C. Byrd. "Coming Events Cast Their Shadows." Robert C. Byrd Congressional Papers. Accessed 21 April 2019. http://acsc.lib.udel.edu/items/show/312.